ON the wall of his wood-paneled basement in his suburban Long Island home, the drummer Roy Haynes has a large poster of his idol, the Count Basie-band drummer Jo Jones. In the picture, taken in 1940, Jones stands outside of a building in a hat, suit and full-length overcoat, holding a cymbal with his left hand and a brush with his right. The stance is all casual defiance: Jones's feet are spaced apart, his chin and his eyebrows are raised. "He was the man," Mr. Haynes said. "And he carried himself like that." A few summers ago Mr. Haynes invited four other drummers to his house in Baldwin, N.Y., where he lives alone. Mr. Haynes, Eddie Locke, Ben Riley, Louis Hayes and Jackie Williams ended up standing around the picture, drinking Champagne and talking about Papa Jo. More recently, early last month, Mr. Haynes had some visitors over to listen to CD's and talk about what he heard. Inevitably, Jones kept coming up. Jonathan Jones, who died in 1985, made the high-hat significant in articulating jazz rhythm, and it has ever been thus. He played authoritatively with brushes, not just on ballads. He snapped down his patterns with subtlety and force; he ploughed powerful grooves for a band. He didn't get involved in long solos; above all, he had vitality, magnetism. One learned just by watching him move around. He was confident, and inspired some fear. He was proud of his "kiddies," the musicians he influenced. (He became known as Papa Jo in the late 1950's, in part to distinguish him from Philly Joe Jones, Miles Davis's drummer.) Toward the end of his life, he liked to perform sections of concerts on the high-hat cymbal alone. Roy Haynes — who will celebrate his 81st birthday by leading his young band at the Village Vanguard from Tuesday to Sunday — never took a lesson from Jones. But Mr. Haynes has a whole area of technique around the high-hat, treating it as an instrument unto itself, building on Jones's principles. Really, he isolates every part of his drum kit in a similar way, letting it sing. He is naturally attention-getting, breaking up time, making his drum set react, hitting hard and then leaving space. A musician isn't only what he plays. Jones approved of Mr. Haynes for his self-possession, too. Mr. Haynes bought his first car in the summer of 1950, the same week Miles Davis did. "Young jazz musicians buying cars was not heard of," he said, proudly. "Let alone a supposed bebop drummer." He now owns four; one is a Bricklin, the rare car with gull-wing doors, manufactured for only two years, in the mid-70's. And he likes some crackle in his leisure. When he comes into Manhattan and he's not working, he said, he often rents a limousine. "I'm like a little kid. I'm so excited, man. I just party, enjoy." He bought a second house in Las Vegas in 2001; he travels there every few months, and goes out to clubs and restaurants with his friends. And the clothes. He often cites his inclusion in a list, created by Esquire magazine in 1960, of the best-dressed men in America. A musician in his 30's told me he met Mr. Haynes recently at the Vanguard. He mentioned to Mr. Haynes that he had just played there himself. "I was wearing jeans and a flannel shirt, and my hair was dirty," he said. "Roy just looked me up and down. And then up, and then down again. He said, 'Huh.' "
Jo Jones was the natural place to start, and other subjects flowed from him. At the top of Mr. Haynes's list was "The World Is Mad" by Count Basie from 1940, with Jones on drums. But since all CD's that include it have gone out of print, I brought instead a Basie box set called "America's No. 1 Band!" since it covers that same period. We listened to "Swing, Brother, Swing," which is about as good as American music gets. It comes from a radio broadcast in June 1937, recorded at the Savoy Ballroom in New York; it is the Basie orchestra with Jones on drums and Billie Holiday singing. The groove is vicious, menacing; as the band restrains itself for the first chorus and then gradually turns it on, the guitarist Freddie Green drives the rhythm, chunk-chunk-chunk, and Holiday phrases way behind the beat. "Ra-rin' to go, and there ain't nobody gonna hold me down," she sings. 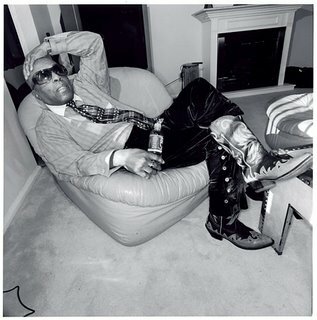 Mr. Haynes, wearing velvet pants and cowboy boots, sat on his living-room sofa and crouched close to hear the details. "Can I hear that little part again?" he said. "I thought I heard a cowbell." He did. Jones hits the cowbell three times at the start of the second chorus, linking the bars together. From that point the band surges a little, makes the song meaner. "Aaah-haaa!" Mr. Haynes hollered. "That's a hell of a one to start with, man," Mr. Haynes said, shaking his head. "If anybody wants to know what swing is, check that out. Damn! Everybody's in the pocket. You know, you just feel it: I see people dancing." Mr. Haynes played with the three greatest female singers in jazz: Sarah Vaughan, Ella Fitzgerald and Billie Holiday. His time with Holiday came during her last run at a club, at Storyville in Boston, in 1959. Late Holiday is different: it communicates frailty; it's not rhythmically invincible, like this. "But there were still nights when some of that feeling was there," he said. Mr. Haynes was born in Roxbury, Mass., where his parents had moved from Barbados; his father worked at Standard Oil in Boston. An older brother, Douglas Haynes, was a trumpet player who attended the New England Conservatory of Music in the late 1940's after his Army service; he traveled to New York when Roy was still in high school, and came to know musicians at the Savoy Ballroom. He introduced Roy to a number of them, including Papa Jo Jones, one night at the Southland Cafe, before Roy left Boston in 1945 for New York. Mr. Haynes's next choice was "Queer Street," again by Basie. "There was a White Tower, a hamburger joint, on Broadway and 47th Street," he remembered as the song played. "They had a jukebox there. I would put dimes in, and keep playing it over and over." What he wanted to hear, he said, was Shadow Wilson's complicated two-bar fill on the snare drum near the end of the song. Wilson later played more modern music, famously in a short-lived quartet with Thelonious Monk and John Coltrane. "But I took him as a big-band drummer," Mr. Haynes said. Max Roach is two years older than Mr. Haynes; they were two of the important drummers in bebop's first wave. "When I heard Max the first time," Mr. Haynes remembered, "I said to myself, He loves Jo Jones too." We listened to Coleman Hawkins's recording of Dizzy Gillespie's "Woody 'n' You," from February 1944, written by Gillespie. It is considered the first bebop recording session. Gillespie is in the group, and Max Roach is the drummer. "I was impressed," he said of Mr. Roach. "It was like he was talking to me." Mr. Haynes especially identified one detail: as Hawkins finishes his first solo in "Woody 'n You," Mr. Roach makes the final beat of the bar part of a figure that enjoins the bar with the next, and also the next chorus of the song. It breaks up the flow of time; it creates tension, and it stabilizes, too. Later in the song, during a trumpet solo, Mr. Roach thuds the bass drum, creating a single off-beat palpitation in the middle of a bar. "There," Mr. Haynes said. This was from when bebop was just beginning to take over, and Mr. Haynes was in the middle of its creation. He saw some older musicians' dissatisfaction with the way jazz was changing then — becoming more melodically fractured, more staccato, more drum-centered. But from 1947 to 1949, Mr. Haynes played with Lester Young, the paradigmatic soloist of the period before bebop, and had no problem. "I had heard Lester didn't like people getting too involved," he said. "But he liked the way I was getting involved. I was dancing with him from up here," he said, holding his hand up at the level of his head — meaning the ride cymbal. "I was doing stuff with my left hand and right foot, too, but I was always feeding him that thing from up there. I was swinging with him. It wasn't particularly hard swinging; we were moving, you know, trying to paint a picture." Young approved. He did something similar with Coltrane, when he filled in for Elvin Jones in the John Coltrane Quartet from 1961 to 1965. After you become used to Jones's drumming in the Coltrane group, hearing Mr. Haynes is a revelation: since the emphasis pulls away from the bass drum and toward the snare and cymbals, you can suddenly hear the bass and piano more. It has become almost a cliché to compare Mr. Haynes's improvising to the sound of the timbales player in a Latin band, but Mr. Haynes has never talked much about Latin music. He had told me that he used to be friends with Ubaldo Nieto, the timbalero from Machito's orchestra. I suggested that we listen together to Machito's "Tanga," recorded at Birdland in 1951. This "Tanga" changes its atmosphere several times, through switches of key or tension building from different sections of the bandstand. Then suddenly the entire language alters. Cuban rhythm becomes swing; hear a drum kit and cymbals instead of conga and timbales, and Zoot Sims starts playing a tenor saxophone solo. Mr. Haynes confirmed that it was Nieto, changing over to a drum kit mid-song. "We were always playing opposite Machito in Birdland in those years," he said. "And I always did like the sound of timbales, the approach. Sometimes when I'd play my solos, I'd approach the traps with that same effect, like when I hit rim shots." (A rim shot means hitting the head and the rim of the drum at the same time.) "Older gentlemen like Chick Webb and Papa Jo, they did rim shots too. But doing it with no snares on, with that tom-tom sort of Afro-Cuban feeling, I always liked that." Finally we listened to Vaughan singing "Lover Man," from 1945, with Dizzy Gillespie and Charlie Parker. (The drummer is Sid Catlett.) It is what Mr. Haynes called a walking ballad, not as extravagantly slow as the kind he had in mind, like the version he recorded with Vaughan in 1954. "She sang some of the slowest ballads, probably, in the world," he said. "And in the 50's, we had bass players like Joe Benjamin. Bass players in those days had a way of letting the notes ring out. We don't get that with a lot of young bass players today. With drumming, there was an art to playing it and making it sustained, making it sound full with brushes. But you've got to have the right rhythm section to make it sound effective. And we did, every night. Moment by moment, there was always something musical happening. And during that period, man, her voice was ... mmm. Uncanny." He paused. "The memory of the whole time is cool. That was the first time I ever went to Europe. In Paris, we played with Coleman Hawkins and Illinois Jacquet on the same show. I backed up Coleman. And that was the first time I ever had my picture on the cover of a magazine. In Paris."